There is an impressive modern station in the city of Paju in the far north of South Korea. The walls are plate glass, the roof is swooping brushed steel; its supporting rods are fashionably exposed. There are seats for a trainload in the waiting area and a long line of toilets and sinks. The station was built to be busy. 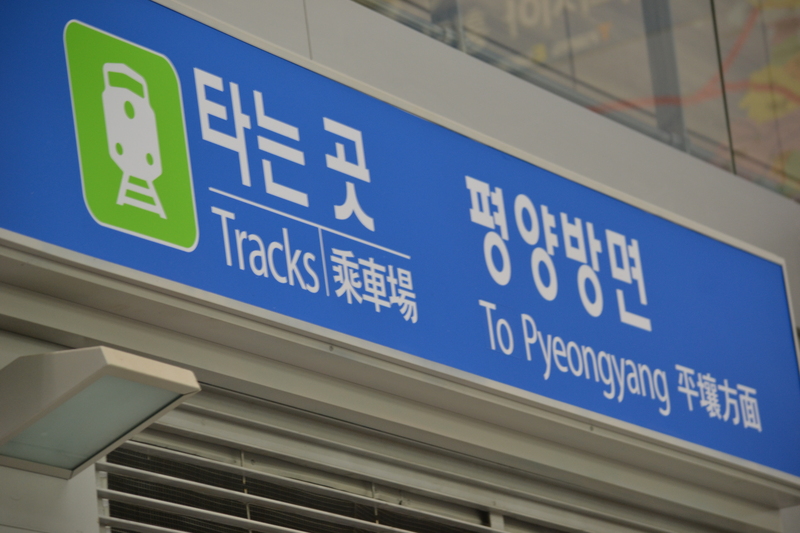 A map on the wall shows connections through Korea, across Asia to every city in Europe; and a sign directs passengers to the trains for Pyongyang, the capital of North Korea. There are carousels, baggage scanners, customs desks and all the paraphernalia of international transport hubs. Across the road, there are goods warehouses and yards big enough for articulated trucks to manoeuvre. But the warehouses are empty, the carousels stand idle, and no trains go to Pyongyang. The border is sealed with high fences, razor wire, tank traps, and watchtowers manned by soldiers with machine guns trained, and regular patrols by squads in combat gear. 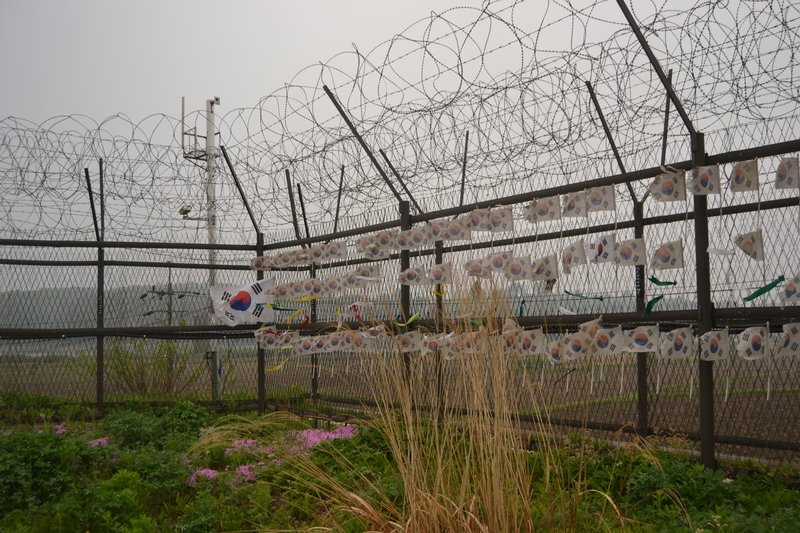 The only trains which run into the station – three or four a day – are specials bringing tourists to see what is ironically known as the Demilitarized Zone and to peer through telescopes into the North at what they claim is a farming village, although the only people you see are the armed guards in the watchtowers. But it has the World’s Third Largest Flagpole. In the South it is known as the Propaganda Village. The station, too, looks like nothing more than an elaborate, expensive, political gesture. But things seemed different when it opened in 2002. The Korean Cold War had briefly thawed. North and South had been talking since the end of the nineties. They committed to working towards peaceful reunification. They agreed that the railway lines across the border should reopen, that families separated by the war half a century ago should be able to meet; that Southern companies should build factories on the other side of the border and Northern workers should staff them. Optimists thought that reunification was bound to happen soon. The mood did not last. Relations grew frostier when the South’s most powerful ally included the North in the ‘Axis of Evil’ together with Iran and Iraq. They chilled further towards the end of the Noughties when a new government in Seoul resolved to take a hard line with Pyongyang and strengthen relations with Washington. The North, in its turn, froze off any prospect of further cooperation with a series of gross provocations. It sank a ship, bombarded an island, kidnapped soldiers and tested nuclear weapons. By then, the idea of taking a train through Korea, across Asia to cities in Europe seemed entirely fanciful. Just this week, it was reported around the world that the North had test-fired ballistic missiles from a submarine and might double its stockpile of nuclear warheads by the end of next year. It is hard, now, to imagine peaceful reunification happening any time soon. Then again, that might have been said about Germany a year before the wall came down. I visited this station recently. I didn’t even know it existed. Really interesting.. I think it’s inevitable eventually, and may well happen more abruptly than we anticipate (as with the soviet bloc). But it’ll surely flatten the economy in the South. Yes, it will mean many changes for them immediately and my feeling is that will be a huge challenge as a result. It’s very difficult indeed, and i don’t think a reunification is for tomorrow, but we can still hope.